Dog Lost UK – national community of dog owners and volunteers, helping to reunite lost dogs with their owners. Just Dogs Shop – Stockbridge, Edinburgh. Out in the Hills – Guided walks and wilderness camping trips in the Cairngorms and elsewhere in the Scottish Highlands. If you would like to add a link to this site, please feel free to use the text link code below. 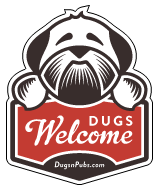 Please note that the “Dugs Welcome”, “I Love Dugs” and “Dugs n’ Pubs” logos cannot be used without permission. If you would like to link to us by using one of these images, or display it on a webpage, please contact us to discuss.